It has been silent around Wolfkind for a while, but here we have a new album. However the music is not hard to describe to people who know Wolfkind, it is hard to categorise it by style. 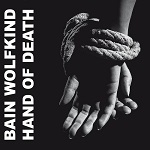 “Hand Of Death” contains the typical, slow Wolfkind sound with his distinctive voice, but rather than a bluesy feel, this new album has the analogue synth sounds of a style such as minimal wave. In combination, it is not really minimal wave though. The new album sounds alright, but in my humble opinion, not more than alright.